More and more people are reading books on tablet computers and eReader devices such as the Kindle and Nook. Recognizing the demand for digital resource works, Applied Ballistics has just releases of its first eBook — a digital version of Accuracy and Precision for Long Range Shooting. This work (which has sold 5000 hard copy versions), is now available in electronic format for both Kindle and Nook eReaders. iPad users can use the Kindle app to access the eBook. This book discusses how to evaluate multiple variables to improve your hit percentage. It explains how to correct the trajectories for drop, wind deflection, etc. through the use of Weapon Employment Zone (WEZ) analysis. WEZ is applied throughout the book, showing readers how to get more rounds on targets, more reliably. Case studies (with live fire verification for many scenarios) show what things affect your hit probability at long range. All formats of the eBook are sold for $27.99 (hardcopy is $34.99). The Kindle book is available directly from Amazon.com, while the Nook version can be purchased from BarnesandNoble.com. Share the post "Digital Edition of Litz Accuracy and Precision Book Is Now Available"
A while back, Werner Mehl of Kurzzeit.com produced a 10-minute video for the 2010 SHOT Show. On the eve of another SHOT Show, we thought you’d like another view of a stunning video that became a huge hit on YouTube. This video has has been watched over 8.2 million times, making it one of the most popular shooting-related videos in history. Employing cameras recording at up to 1,000,000 (one million) frames per second, Mehl’s bullet flight video has been called “astounding”, “mesmerizing”, and a “work of art.” If you haven’t seen it yet, sit back and enjoy! Click the link above to learn more about Werner Mehl and his super-sophisticated camera systems that can record at 1,000,000 frames per second. On the same linked page you can learn about the advanced PVM-21 chronograph (now sold as the PVM-2008 or PVM-08) designed by Werner. Operating “all-infrared, all the time”, the PVM-21 is the best optical chronograph we have tested for very low light conditions, or very tricky light conditions. 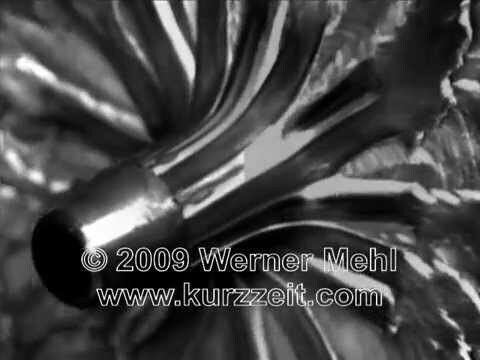 Share the post "Werner Mehl’s Million-Frame-Per-Second Bullet Video"